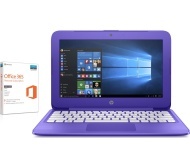 alaTest has collected and analyzed 128 reviews of HP Stream 11-y051sa 11.6" Laptop - Purple. The average rating for this product is 3.6/5, compared to an average rating of 4.1/5 for other products in the same category for all reviews. Reviewers really like the design and price. The size and usability are also appreciated, whereas many are negative about the energy efficiency and screen. We analyzed user and expert ratings, product age and more factors. Compared to other products in the same category the HP Stream 11-y051sa 11.6" Laptop - Purple is awarded an overall alaScore™ of 86/100 = Very good quality. Hardly and space, had to contact Microsoft support numerous times, I’m just using for very basic needs. The purple is much darker then I thought but as it looks much different than any regular laptop, my daughter loves it!! User friendly, easy to set up. Nice colour. 11 year old loves. Once it took a long time to turn on. Not keen on the keyboard, looks a bit cheap. It’s good value for money and it’s easy enough to carry around with a laptop case and the performance is exceptional worth buying it. Apart of no disc drawer on the side that’s all. It is light and perfect for my daughter who just wanted a computer to mess around with and play teachers with. The Word applications only last a year on it. So slow. Took it back after two days. There is nothing I dislike about it. I brought this for my daughter and it’s great for everything she needs to do on it.